Priscillas: Thrifting and Stitching ..Two of my Favorite Things ! Thrifting and Stitching ..Two of my Favorite Things ! 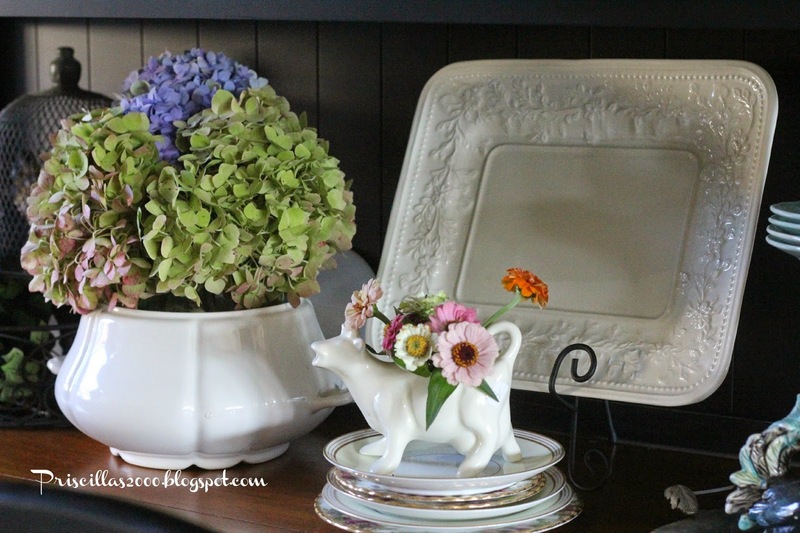 I wanted to share some of my favorite thrifty treasures I have found lately .. 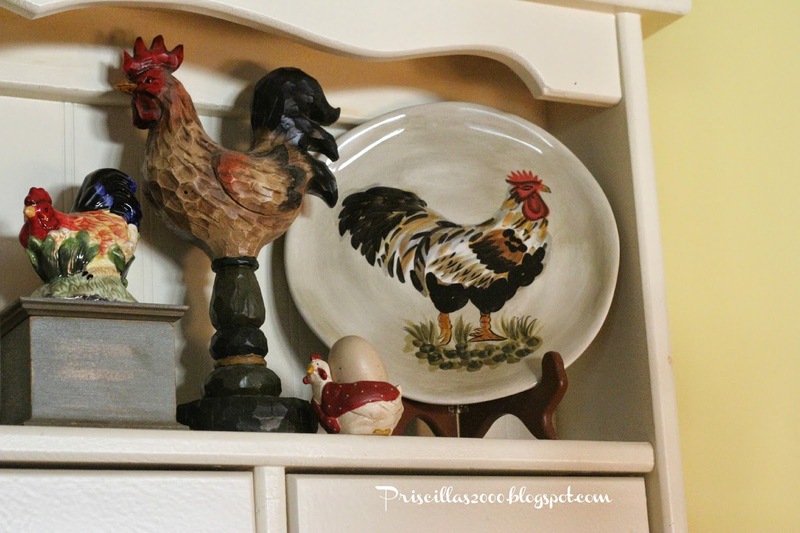 I have a thing for chickens ..the kitchen is full of them ! I found this chicken soup tureen at a Goodwill up in Wisconsin .. 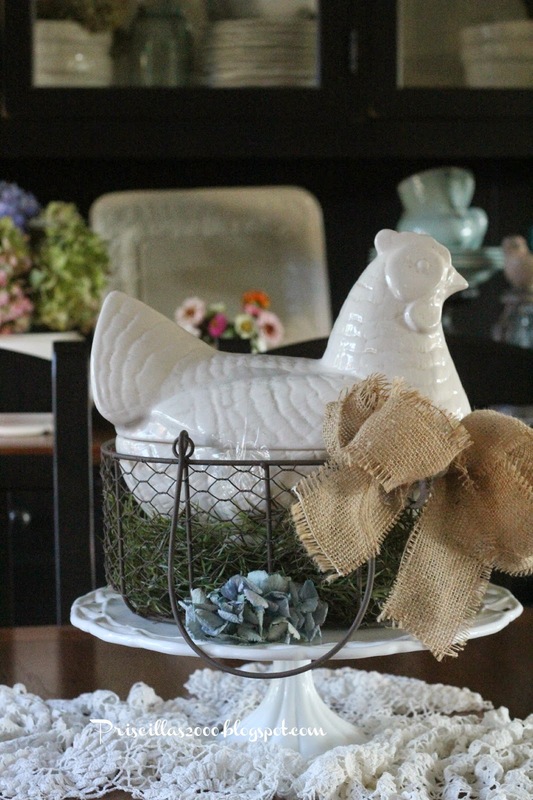 It fits perfectly in tis chicken wire basket thats on my dining room table . I also got one of the soup tureens on top of the hutch from another Goodwill ..the one on the left came from an Estate sale this winter. I got this little cow creamer at the thrift shop here in our town for $3.00 ! It is vintage and so cute ! 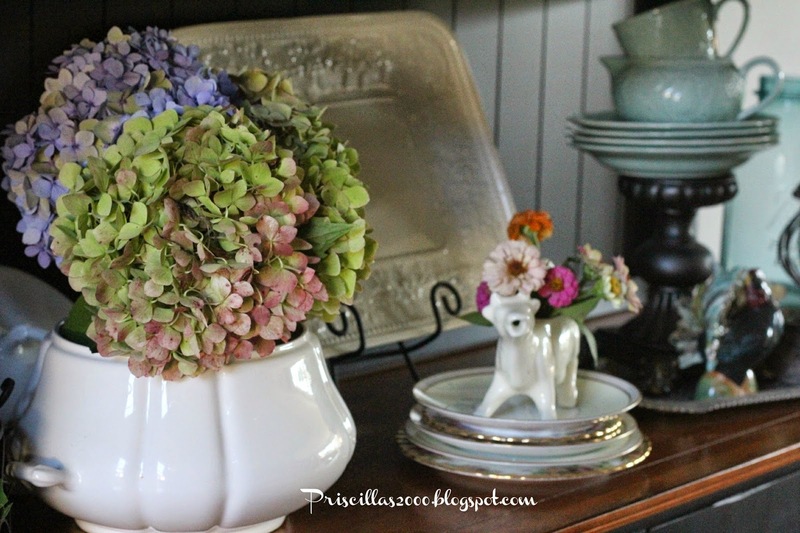 The soup tureen with the hydrangeas in it was also from a Goodwill.. Yhe hydrangeas are from my garden ..Love them ! Now in the kitchen , my daughter found this guy at the Goodwill ..Isn't he the cutest ! He was $3.99.. About a week later we were at a church rummage sale and there was a cow just like him that I found for my daughter since she is crazy for cows ! I also found this chicken plate for 99 cents , that looks like it goes with another chicken plate I got at the Goodwill .. Here they both are together. 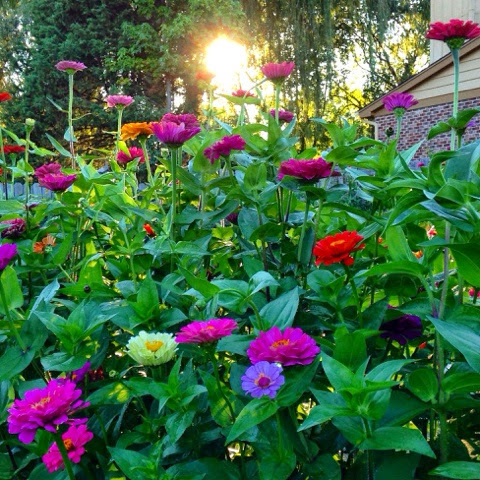 I took this photo with my Iphone last night in the garden as the sun was setting .. Love my patches of zinnias! I finished stitching Prairie Schooler Pumpkin Patch on Friday .. I have been working on this only on Fridays since the first of the year .. So glad to have it finished ! 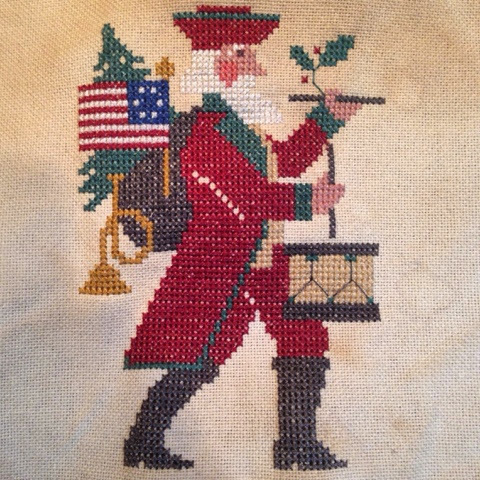 Last Sunday I finished this Prairie Schooler Santa for the Santa tree and I am currently working on the 2014 Prairie Schooler Santa ..
What great finds Priscilla! 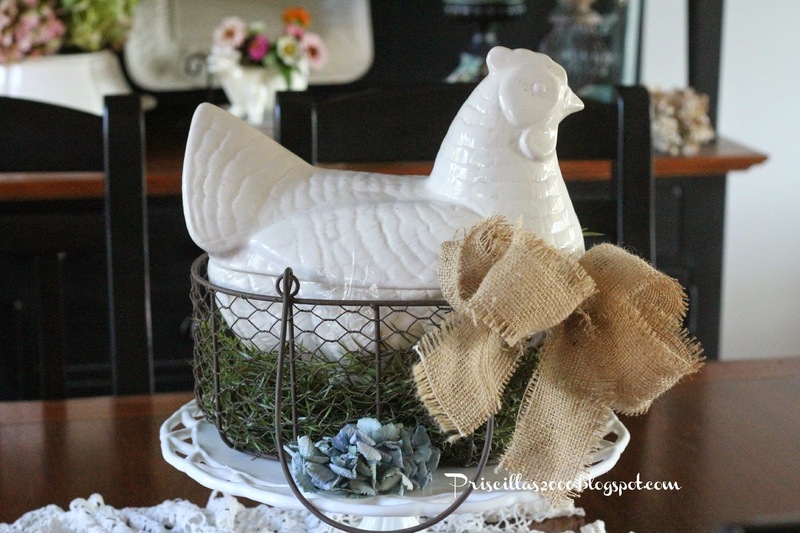 Adore the chicken tureen and the creative way you are using it. I'm growing masses of zinnias this year, too. Yours look very healthy and happy! And your stitchings are so lovely, too! 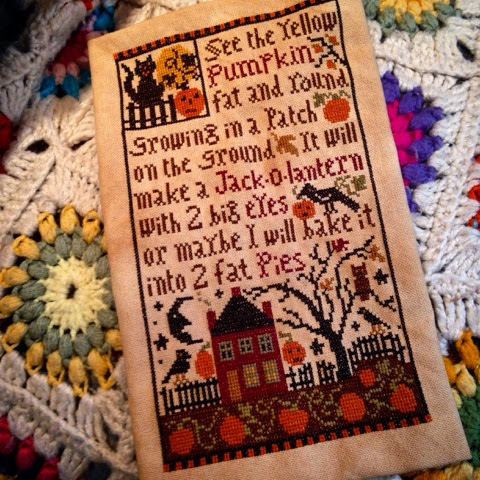 I love the cute poem about the Yellow Pumpkin! Would love a piece of that pie! Everything looks beautiful. Congrats on the halloween finish. You always find the best things in thrift shops, Priscilla!! And I just love those new PS finishes... The Pumpkin Patch is one that I've been meaning to stitch for a long time now--maybe you've inspired me to pull it out and get started! You find the cutest things at thrift shops. I think you have a talent!! I also love your PS finishes. Every time I see one, I want to stitch it! I have a roaster and chicken kitchen also. So any of our chick-a dees want to leave the coop send them my way. You really did find some great things. 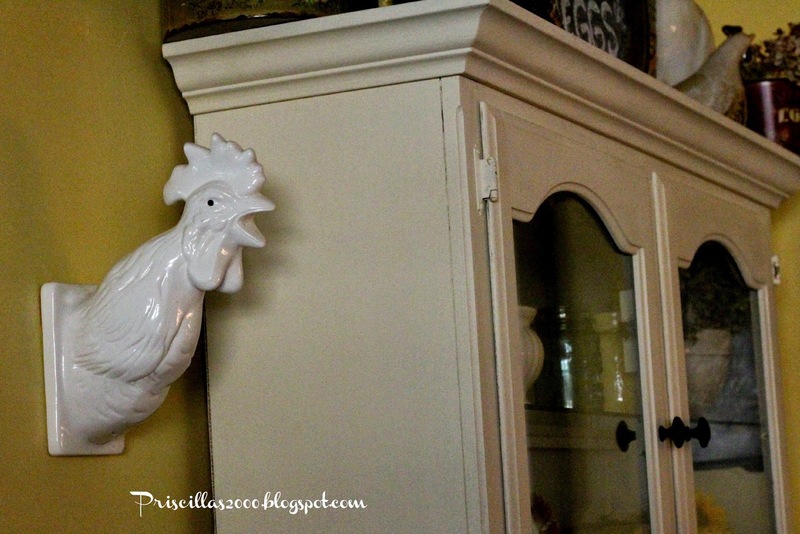 Priscilla your roosters caused my heart to flutter. 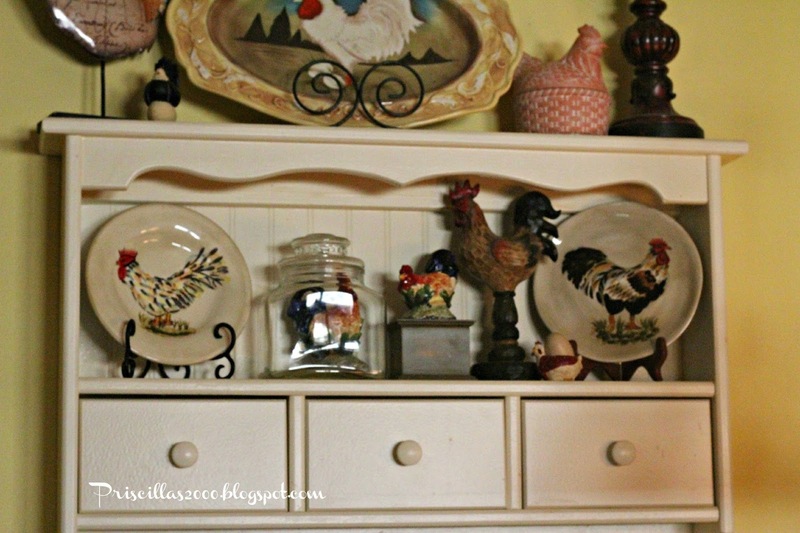 I have roosters in my kitchen and sun room. What a beautiful home you have. 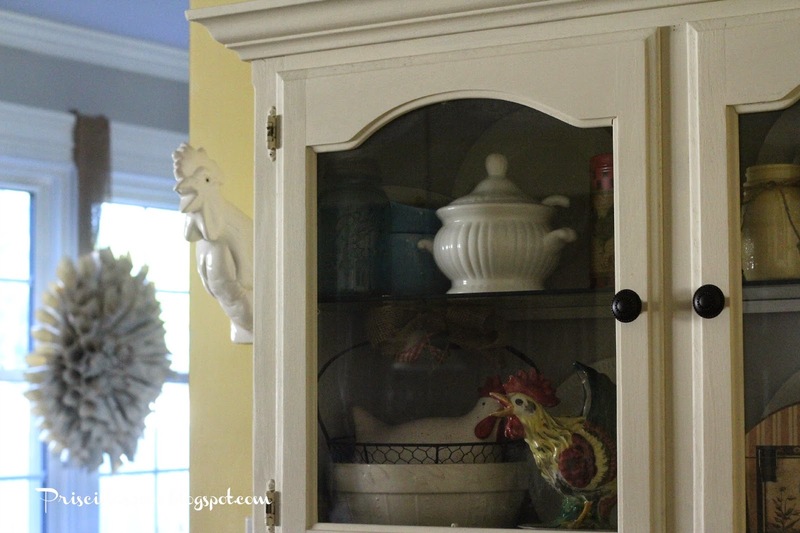 Lovely post, love your thrifted chickens, the wall hanging chicken head is great. And the plates were made for each other. You certainly are very lucky in your finds, you seem to find lots of nice treasure. And your stitching is beautiful, how will you finish it? Your header picture is brilliant, is that your house??? All those pumpkins they look amazing, Autumn/Halloween is just great for decorating, isn't?? 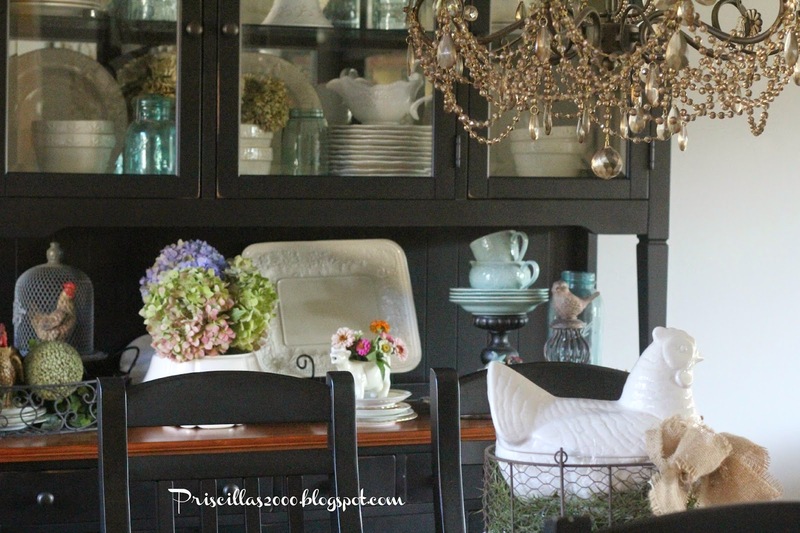 I've been following Cozy Little House blogs for years.. Found you on Tweaking today.. I love your chickens and roosters.. I found a real beauty of a rooster at Goodwill not long ago.. Love that place.. I love your PS finish! And I've fallen off of my Santas...but have big plans for them coming up here soon! So happy to have found your blog. I'm your newest follower! 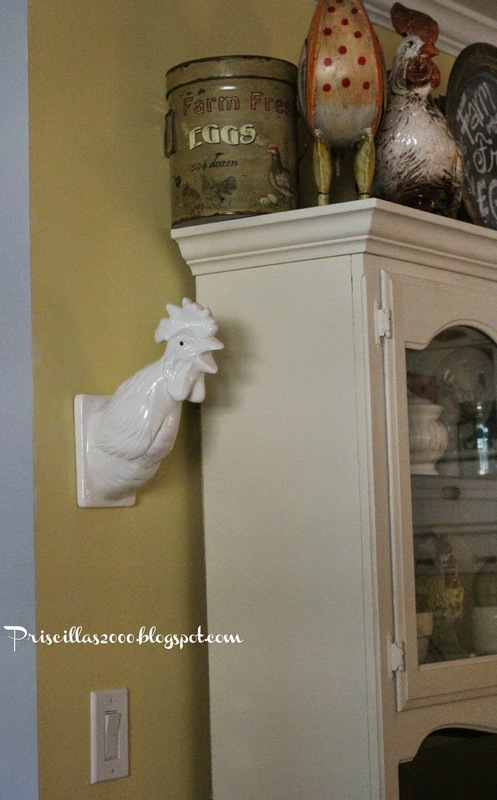 We have one of the same addictions...I love chickens! I have them everywhere too...but I also love cows, so I would enjoy thrifting with both you and your daughter. I love estate sales too. I used to stitch, but my arthritis and my eyes just won't allow me to do that anymore...yes, it's a bummer...but I can enjoy yours that much more. I started blogging, but life got in the way, so I haven't blogged at all lately. 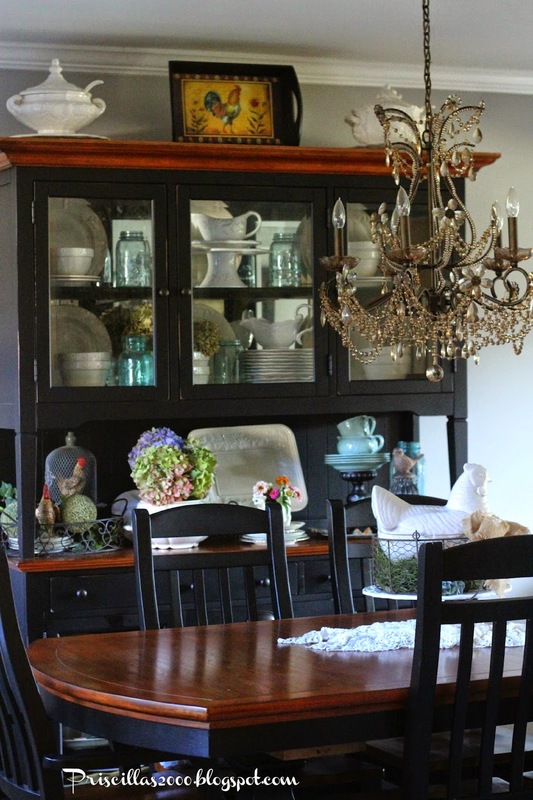 I absolutely adore tablescapes. I haven't looked yet to see if you have that addiction too, LOL. I know I'm going to enjoy all your past posts. Love the chickens you found, they are too cute! Everything looks so beautiful! Thanx for shairng at THT. So many great finds! 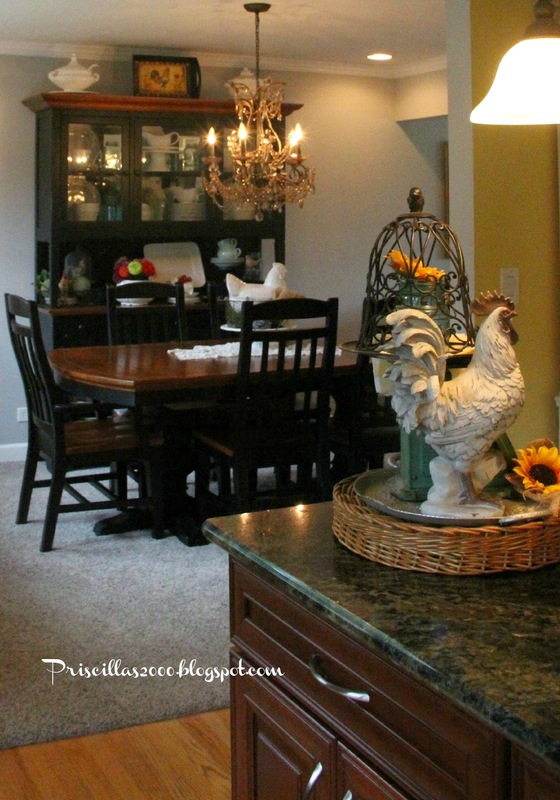 Love your table centerpiece and your collection of roosters! Great treasures! It makes me want to go on a hunt.